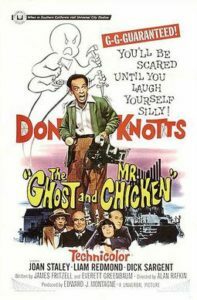 Here is a rather mediocre film that nonetheless features a rather great performance by its star Don Knotts. The basic premise loosely resembles the story “A Fairy Tale About a Boy Who Left Home to Learn About Fear” from Grimm’s Fairy Tales, about staying in a haunted house to win the affections of a girl. Knotts plays Luther Heggs, an inept man working for a newspaper with aspirations to be a photojournalist. Another reviewer aptly described the protagonist as having “delusions of adequacy.” A recurring gag is that as Knotts fumbles about awkwardly and timidly some unidentifiable person in the back of a crowd yells, “Atta-boy Luther!” Knotts’ finest moment comes when the small town he lives in presents a luncheon in his honor and he gives a speech. This speech manages to include a practically exhaustive collection of every inept mistake a nervous presenter can make. Knotts opens speaking in a whisper no one can hear. He talks mostly about writing the speech, without actually saying much beyond that, other than to briefly pander to the audience by expressing support for the military — a complete non-sequitur. His hands tremble uncontrollably while holding his notes. The speech just kind of ends abruptly, without ever having made a point. Knotts is positively brilliant in the scene. As a whole, the film is one of those stiff Hollywood set-bound films that is only slightly more advanced in production values than a television sitcom of the day, and there just aren’t quite enough jokes/gags. But, it is watchable and Knotts shines through the merely passable filmmaking and writing. This also perhaps influenced Scooby-Doo, Where Are You? Previous Previous post: Michael Hudson & Charles Goodhart – Could/Should Jubilee Debt Cancellations Be Reintroduced Today?